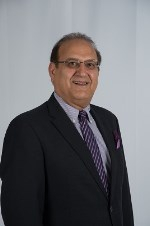 Specializing in Neonatal-Perinatal medicine and Pediatric Cardiology, Hamid Movahhedian, MD has been a member of the Tri-City Medical Center family for more than 20 years. In 2005 he became the NICU Medical Director, and in 2006 the Chief of the Division of Neonatology. During his 20 year tenure at Tri-City, he also served as both Vice Chair and Chair of Pediatrics. He has dedicated his career to caring for the most vulnerable patients, successfully overseeing the management and growth of the only Level III NICU in North County.